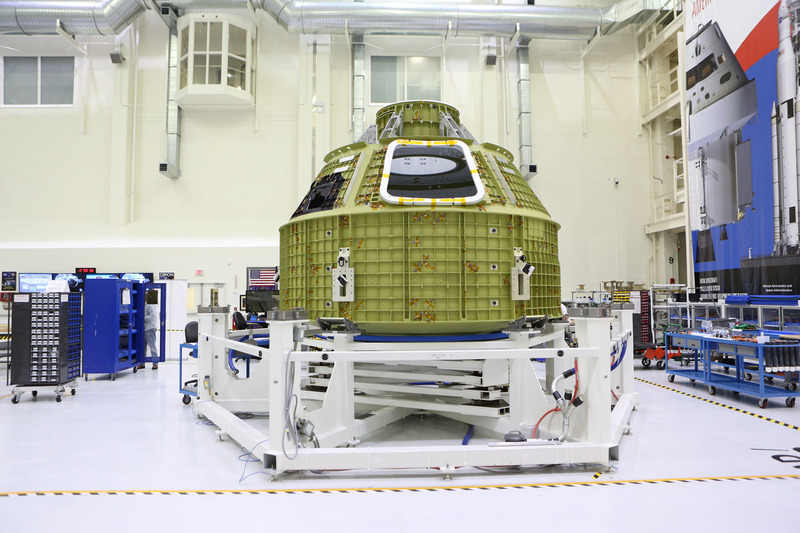 The Orion crew module was moved from a work station to the proof pressure cell in the high bay of the Neil Armstrong Operations and Checkout Building at NASA’s Kennedy Space Center in Florida on Jan. 26 to prepare for testing. Engineers and technicians with NASA and Orion manufacturer Lockheed Martin, will prepare the crew module for a series of proof pressure and leak tests to confirm the welded joints of the propulsion and Environmental Control and Life Support Systems (ECLSS) tubing are solid and capable of withstanding launch, re-entry and landing. The Orion propulsion system includes the propellant and thrusters which support deorbit and re-entry of the spacecraft while the ECLSS provides cooling for interior and exterior components on the crew module throughout the mission. Technicians will attach ground support equipment to the propulsion and ECLSS tubing, and use helium to pressurize the tubing to its proof pressure and to higher pressures at which the weld joints will be checked for leakage. For its uncrewed flight test, Orion will be outfitted with most of the systems needed for a crewed mission during its first flight atop the agency’s Space Launch System rocket from Launch Pad 39B at Kennedy.